How does laser surgery compare to traditional surgery? We do our best at providing our clients with the most modern equipment available! Traditional surgery with a scalpel can bruise or crush tissue but when we use the laser, only an intense beam of light touches your pet, minimizing the pain, swelling, and bleeding associated with surgery. The laser has a unique ability to "erase" tissue. The laser can be used to make incisions or even eradicate unhealthy tissue. It seals nerve endings, so patients are much more comfortable after surgery. The laser also kills any bacteria in its path, reducing the risk of infection. It also seals lymphatics, resulting in less swelling post-operatively. The laser can perform a wide range of surgical procedures on cats, dogs, birds, and many other animals. Our veterinarians will be able to tell you if your pet is a candidate for laser surgery. 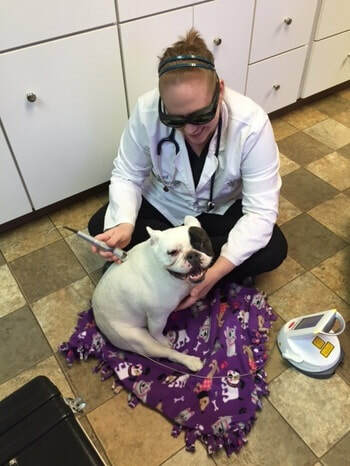 Dr. Erica Knowlton performing cold laser therapy on her French Bulldog Jameson! Laser therapy is the use of specific wavelengths of light to create therapeutic effects which include improved healing time, pain reduction, increased circulation, and decreased swelling. During each treatment, the energy of the laser increases circulation, drawing water, oxygen, and nutrients to the damaged area. This creates an optimal healing environment that reduces pain, swelling, muscle spasms, and stiffness. As the injured area heals, function is restored and pain is relieved. Although improvement is often seen after the first visit, most patients require several treatments for the greatest benefit. Your veterinarian will recommend a treatment plan specific to your pet's needs.